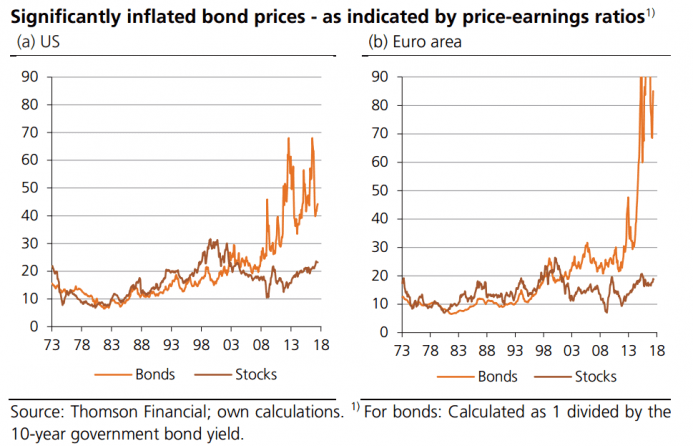 You do not need to be a financial market wizard to see that especially bond markets have reached bubble territory: bond prices have become artificially inflated by central banks’ unprecedented monetary policies. For instance, the price-earnings-ratio for the US 10-year Treasury yield stands around 44, while the equivalent for the euro zone trades at 85. In other words, the investor has to wait 44 years (and 85 years, respectively) to recover the bonds’ purchasing price through coupon payments. Meanwhile, however, the US Federal Reserve (Fed) keeps bringing up its borrowing rate; and even the European Central Bank (ECB) is now toying with the idea of putting an end to its expansionary policy sooner rather or later. Most notably, however, US long-term rates have come down since the end of 2016, despite the Fed raising its short-term interest rate. How come? Presumably, investors seem to expect that the Fed might not hike interest rates much further, and/or that higher short-term interest rates will prove to be short-lived, to be reversed quite quickly. In any case, bond markets do not seem to expect interest rates to go back to normal levels — that is toward pre-crisis levels — anytime soon. Several reasons could be responsible for such an expectation. First and foremost, the US economy appears to be addicted to cheap money. The latest economic recovery has been orchestrated, in particular, through a hefty dose of easy monetary policy. It is therefore fair to assume that market agents will have a hard time coping with higher interest rates. For instance, corporations, consumers, and mortgage borrowers, in general, will face higher credit costs and a less favorable access to funding if and when interest rates edge higher. In particular, higher interest rates could send the inflated prices of stocks, bonds, and housing southward. For instance, expected future cash flows would be discounted at a higher interest rate, deflating their present values and thus market prices. The deflation of asset markets would hit borrowers hard: Their asset values would nosedive, while nominal debt would remain unchanged so that equity capital is wiped out — a scenario most investors might assume to be undesirable from the viewpoint of central banks. 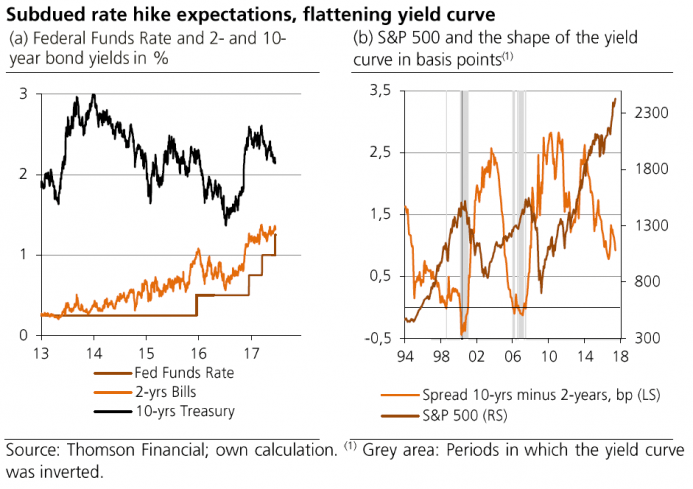 Moreover, the yield curve has become flatter and flatter in recent years. This, in turn, suggests that banks’ profit opportunities from lending have been shrinking, potentially dampening the inflow of new credit into the economic system. A further decline of the yield spread could bring real trouble: In the past, a flat or even inverted yield curve has been accompanied by a significant economic downturn or even a stock market crash. That said, investors might expect that central banks find it hard to bring interest rates back up, especially back to a level where real interest rates are positive. This holds true for the Fed as well as for all other central banks, including the ECB. This is because the monetary policy of increasing borrowing rates by a significant margin would most likely prick the “Super-Bubble” which has been inflated and nurtured by central banks’ monetary policies over the last decades. However, it wouldn’t be surprising if, again, central banks, the monopolist producers of fiat money, turn out to be the major course of trouble. After many years of exceptionally low interest rates, central banks may well underestimate the disruptive consequences an increase in borrowing rates has on growth, employment, and the entire fiat money system. In any case, the artificial boom created by central banks must at some point turn into bust, as the Austrian business cycle theory informs us. The boom turns into bust either by central banks taking away the punchbowl of low interest rates and generous liquidity generation; or the commercial banks, in view of financially overstretched borrowers, stop extending credit; or ever greater quantities of fiat money need be issued by central banks to keep the boom going, inflating prices so that ultimately people start fleeing out of cash. In such an extreme case, the demand for money collapses, and then a Super-Super-Bubble pops. In this context, it is interesting to see that the price of Bitcoin has been skyrocketing in recent years. There are certainly several reasons for this. One reason is undoubtedly the fact that the cyber unit offers a potential “escape route” from fiat money. Bitcoin (and other cyber units as well) might well be seen, and increasingly so, as a “safe haven” in future times of trouble. And there will be for sure new waves of trouble going forward — whether central banks will tighten interest rates or not. 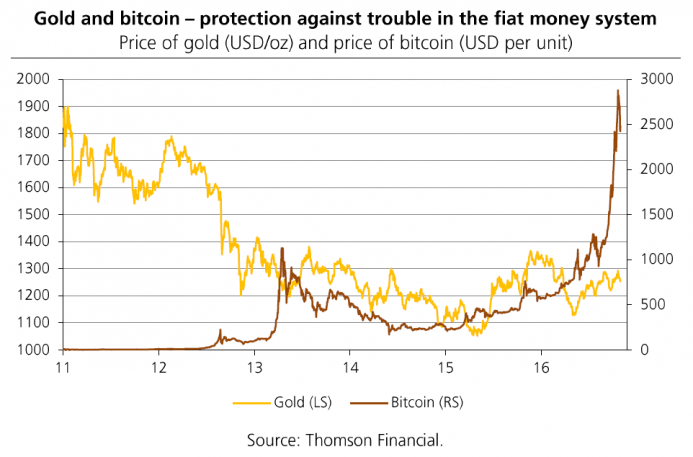 As alternatives to fiat money become increasingly accepted, positive spill-over effects can be expected for gold. Gold has always been the monetary prototype of a “safe haven.” It may be increasingly in demand for its store of value function going forward and, by making use of the blockchain, even as a digitalized means of payment representing a claim on physical gold. Once the Super-Bubble pops, we will see for sure what people demand as the ultimate means of payment: gold or cyber units, or both.